In AuZtralia you will build railroads to explore the interior, mine resources and settle farms to collect gold. With this gold you can buy military units to protect your assets and stop the advancing hordes of madness. The ultimate purpose of the game is to survive long enough without being eliminated. Whomever has the most victory points at that stage is the winner. And mind you, this can very well be Cthulhu himself! 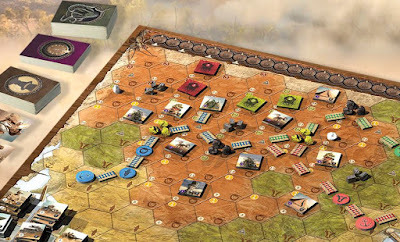 The game includes a dual sided board, representing East and West Australia, with a different layout and slightly different rules. It shows hexes with different terrain types and provides all relevant information without unnecessary distraction. The resource components are custom made, a nice touch that enhances the presentation. 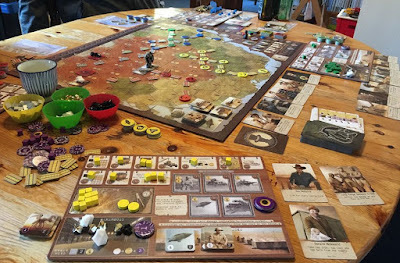 Additional player stuff (tokens, cubes and discs) are more traditional but more than adequate. Player boards are available to track the storage of your resources and units. These are well layed out and display the necessary info for your actions. Cards are also included for different parts of the game. They are nicely illustrated and contain clear descriptions. No remarks on the manual either. After a first lecture I didn't have the feeling that I missed anything. Lots of examples, some flavor text and an overview of most card descriptions; what do you want more? Maybe a player aid? Check! It provides a summary of relevant info and even has a section on easily overlooked rules. So, only thumbs up component wise. During setup survey tiles are placed randomly on key locations on the map. They are used to determine the initial distribution of resources and the starting position of the first wave of minions. To keep the suspense, they start face down but you can expect following types: loyalist (collaborating human), zombie, mi-go (a giant flying cockroach), shoggoth (yikes) and the devastating Cthulhu. 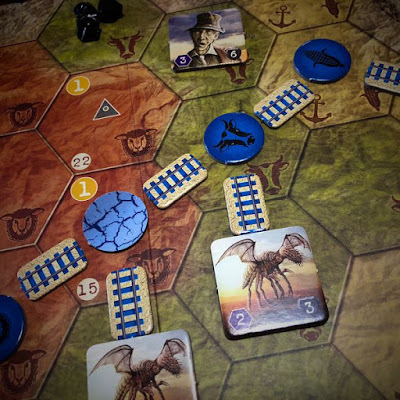 Players each choose a hex at the coast where they set up a port. This is the base for further exploration by railroad, and it should be protected at all cost. The game is action based where each action has a time cost. This is tracked on a time track and the player in last position automatically becomes the active player. An interesting mechanism, already used in other games, and it adds another level of tactics when planning your actions. Talking of actions, there are plenty to choose from. You can build railways, mine resources, recruit help (each helper providing a specific bonus that can be permanent, once per round or once per game), buy military units (infantry, armored cars, artillery, armored train and zeppelins), settle farms (for Vps and gold), do import/export (getting or selling extra resources) and attack the enemy. Each time you perform an action, a cube is placed on your action area and the time cost is applied. However, for each cube already on the action area you have to pay 1 gold. If you want to avoid the extra cost, there is a retrieve action which lets you take back all your cubes, but this also costs time so you might want to plan this carefully. All enemies start dormant, but the Ancient Ones also have a disc on the time track (a little before halfway). When this disc ends up in last place, the Ancient Ones awaken. The disc moves one place, optionally a revelation card is drawn and resolved (causing mostly negative effects such as monsters revealing, spawning, moving or killing helpers) and finally a card is drawn to trigger movement for specific monsters that are already revealed. Note that they always move towards the farm or port that is closest by. In case of a tie the card indicates a preference by hex orientation. When a farm is overrun, it is blighted and provides Vps for Cthulhu. When a port is overrun, the game ends immediately and end of game scoring is initiated. To prevent this from happening, you should attack and destroy the monsters before it's too late. Players continue to perform time based actions until all discs, including that of the Ancient Ones, have reached position 53 on the time track. Final scores are now calculated. For players this includes points for farms, resources, helper cards and defeated monsters. Cthulhu scores for blighted farms and undefeated monsters (double if still unrevealed!). The player with the highest total is the winner, and as already said in the introduction, this might be Cthulhu himself. 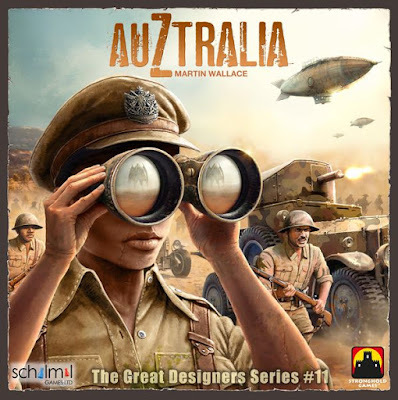 AuZtralia describes itself as a military/economic/adventure game. I see it more as a survival game, with focus on combat. 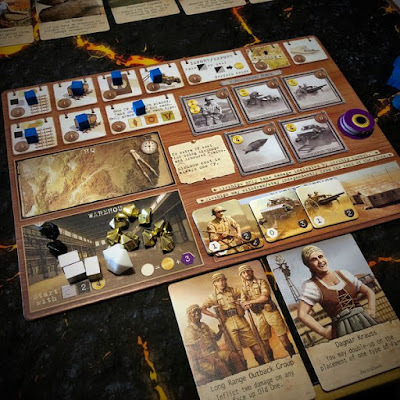 The economic aspect is rather limited: the resources on the map are fixed at the start, there is no production stage (not even for farms) and in the later part of the game you will have to rely heavily on the import/export action to get more resources. Another possible obstacle is that combat involves luck of the draw. If your target is revealed, you can compose an army that has better chance at defeating it but that's still no guarantee. Also the sanity aspect may influence your plans. The time track fits well to this game, and adding the Ancient Ones as player is a great touch. The only drawback is that they often get to play two (or more) turns in a row, which can have dire effects. So you should be prepared when you see this coming. Rules for solo play and co-op are available, and the difficulty level can be adjusted. If you're into the Cthulhu Mythos or just want to play a 'tower defense' kind of combat game in WWII flavor with additional aspects, then AuZtralia is a good choice. Oh, and if you're wondering what the Z stands for: Zombie! This game was donated by Stronghold Games / Spiral Galaxy Games and can be played at Het Geel Pionneke from november on.